Fruits and vegetables are an important part of your diet — and particularly so when you're breastfeeding, providing key nutrients to keep you healthy and help your baby grow. Pineapple, a rich source of both fiber and vitamin C, is an especially good choice when you're nursing. 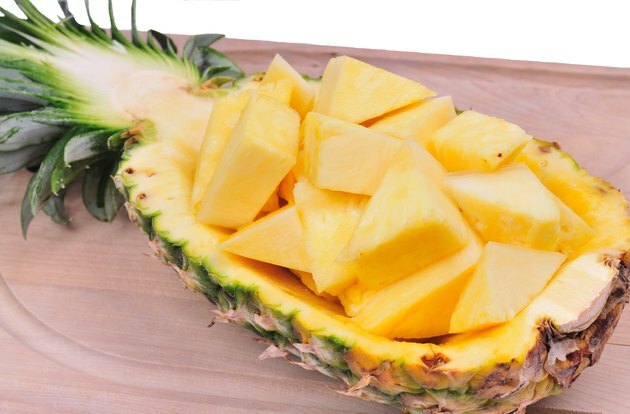 However, because your breastfed baby eats everything you eat, and because infants are at particularly high risk for food-borne illness, you must take some precautions to ensure your pineapple is safe. Wash your hands with soap and water, then thoroughly rinse the skin of a whole pineapple under running water. Though you do not eat the pineapple skin, rinsing is important because microbes can transfer from the pineapple's skin to its flesh during cutting. Cut off the skin, dice the pineapple into chunks and store in a clean, airtight plastic container in the refrigerator. Avoid fresh, pre-cut pineapple, particularly as might be offered at farmers markets and roadside stands, unless you are going to cook it. You have no way of knowing what sanitation procedures were used during cutting. Instead, choose canned or frozen pineapple. The heating process used in canning kills any microbes; frozen pineapple must be washed during processing. Inspect containers of pineapple juice and select only those listed as having undergone pasteurization. According to the U.S. Food and Drug Administration, there is a connection between disease outbreaks and unpasteurized fruit juices. Though most unpasteurized juices are legally required to carry a warning label, those sold at farmers markets are not, so you may wish to avoid these. Refrigerate all pineapple. Even if cooked into dishes such as pineapple pork, the acid naturally present in pineapple will not stop dangerous microbes from growing. All leftovers should be placed in your fridge within 2 hours of cooking. Proper nutrition helps new moms deal with hormonal changes that occur soon after giving birth and helps lessen the risk of serious postpartum depression. Avoid pineapple with soft spots, a sour aroma or colored spots. All these are signs of spoilage. If you must handle spoiled food in order to dispose of it, wear gloves and wash your hands afterward. Can You Eat Papaya Skin? Is Pineapple Good for Losing Weight?